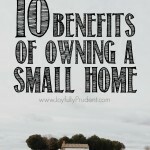 On my blog survey, I got several questions regarding how to be content with what you already have, how to be happy in your home, decorating on a budget, and decorating with small children. Let me just say these questions really resonate with me (I’ll answer each question below). If you are one of the people that asked this, know that I really get you! I am not a crazy spender simply by the way I grew up, but in our marriage, I’m definitely more of the spender…give me $1,000 and I can EASILY find ways to spend it. And when it comes to anything house related, I have to practice some major self-control and contentment. A little background: Our house is 16 years old (lived here for 10 years) and 1960 square feet (3 bed, 2 bath, 1 office). I consider it to be in a cute little neighborhood with a great school. Schools in our city are all good with maybe a few that I’d prefer my kids not to go to. Our house is paid off, so with all that combined, there is no reason for us to move. When we first moved in, we bought some major furniture with money that Ryan had saved up, combined with a few gifts from family. 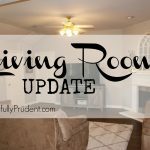 Stuff like dining room furniture, breakfast table, entertainment center (gifted), master bedroom furniture, a fridge (gifted), and a washer/dryer. Everything else was stuff we already had. I decorated primarily from thrift stores. My mom and aunt are amazing at decorating with thrifted items. Amazing! I always got the comment that my house felt warm and cozy! How do you stay content with what you have? How do you stay happy in your home? I’d be lying if I said I was always happy in my home, but there are 2 things that help me stay content in my home. 1. Goals/Knowledge – This is the biggest contributor to our happiness. We have goals that determine how we can spend our money. Our goals determine our budget, and our budget determines spending. 10 years ago, when Ryan bought the house, our goal was to pay it off super fast so we didn’t waste hundreds of thousands of dollars on interest. Therefore, we did not re-do much, if anything. We just didn’t have the money. We had also just moved in, so there wasn’t much of an interest to change things. And if I did add decorations, they were usually from the thrift stores…and I promise it didn’t look bad. Now, our goal is to budget so that we are fully funding retirement and so I’m able to stay home. Anything we want to do to the house has to be extra income. Our budget is a little more flexible now that our house is paid for, but we also have less money with me staying home. Ryan’s second job and my Etsy business (and a tiny bit of blogging) gives us some extra income if we need it. The knowledge part comes from knowing how people really live despite their online persona. According to this article, 8 in 10 Americans are in debt. That means majority of what you see in your Facebook feeds or on blogs of lavish vacations, designer clothes, expensive houses, and the like, are all being bought with money people don’t really have. I’m personally okay with house debt as long as it’s within a reasonable amount for someone’s income. But otherwise, no way. If a purse was $30, would you pay $50 instead? No! That’s essentially what we’re doing when we put things on credit card (and don’t pay them off when due). I highly recommend reading Stop Acting Rich and all of Dave Ramsey’s books to know how people truly spend money and how the truly rich are spending. It helps me stay content knowing that someone else’s luxuries are creating debt. And if they’re not? Then more power to them for achieving a great job that pays well and budgeting wisely! 2. The Bigger Picture – I am a really thorough thinker and sometimes I just need to look at the bigger picture. In the scheme of things, we are enormously blessed and fortunate to have what we do. I might be dreaming of more things, but there are people dreaming for what I currently have. There are people in this world starving, dying of diseases that we have vaccines or health care for, and living under bridges. I have no room for discontentment with what I currently have. My husband works hard to provide, I work hard to manage our kids/home, and I’m content with that. That doesn’t mean we don’t strive for things, but it helps to stay content. 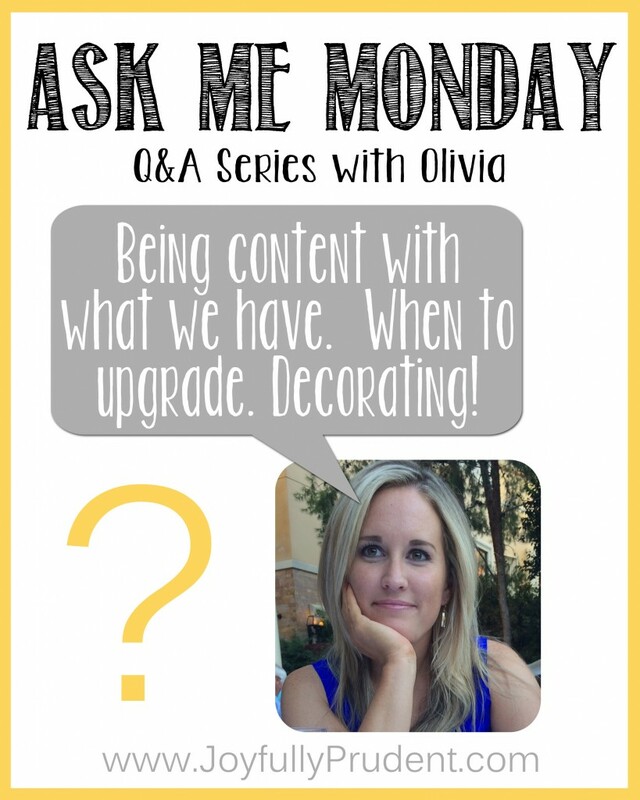 How do you decide to upgrade things in your house when you can’t afford it? I touched on this a bit above, but if we can’t afford it, then we don’t! If it is a necessity (like when our water heater broke last year), we always have a savings/emergency account we can pull from so we don’t go in debt for that. We’ve actually never pulled from that for actual emergencies…we under budget so we usually have extra money for emergencies (or Ryan works extra games). As expected, there are tons of things that are starting to need upgrades. So we budget monthly for those things. I made a list of all the things I wanted to update in our house and Ryan told me to prioritize them so we could plan for each one. I would love to do all of them NOW, but that’s just not realistic. I would love to move soon, but with me being home, updating stuff was much more realistic than moving. That’s kind of how we justified updates. Cheaper to re-paint a room than move 🙂 Let me just tell you, if you are on a budget and really want to redecorate, just paint! 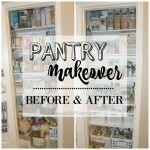 It’s inexpensive, relatively speaking, and can totally transform a room! Plus, once you prep a room to paint, it helps you see what you want and don’t want and can possibly add a few touches of decor to change it up as well. Also, research, research, research and shop, shop, shop around. We research the heck out of something before we do it. 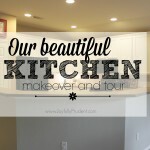 For example, repainting our kitchen cabinets. We researched who would be best to paint them until we were happy with the amount we paid for what we were going to get. And I shop around…a lot, before I purchase (or keep the tags on until I know it’s permanent). 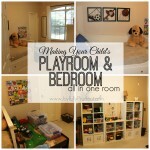 How do you have time to redecorate with kids? I love this question! And laughed because I totally feel the pain for who asked this. Let me just say that redecorating takes SO much longer with kids. As you guys know, I’m STILL putting the finishing touches on my office, which has now been “underway” since about April, 5 months ago. Literally though, I do it at night when kids are in bed or Ryan is home. Or we do it on the weekends when both of us are home and can do it together or one of us watch the kids. Summer time is always a good time for us because Ryan is not working as much. Bottom line, I don’t sleep a lot. It’s a problem that you guys know I’ve been trying to remedy for over 3 years now. 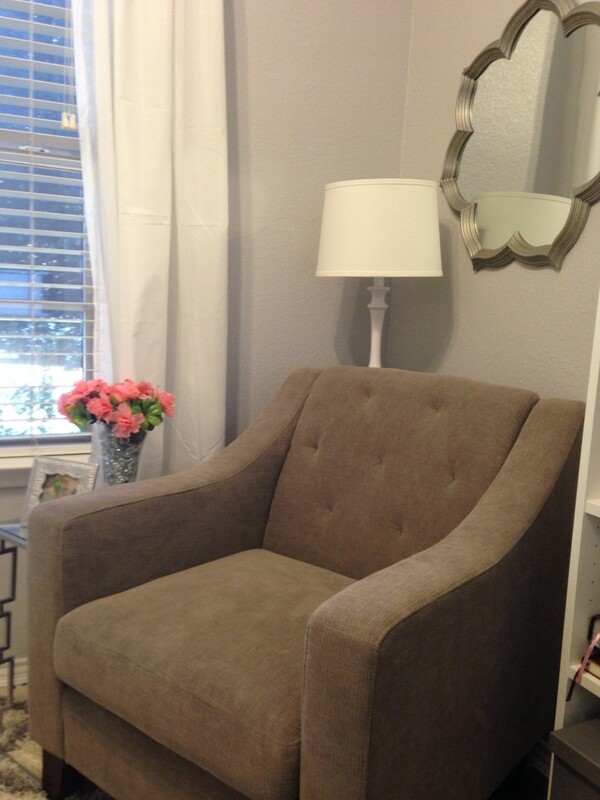 Redecorating is one of my favorite things to do, so I enjoy spending free time doing it. How do decorative items not become toys? I really want to be friends with who asked this! Girl, I know! Simple answer, they do. Decorative items usually become toys. Let’s just say I have simplified things around my house by donating them or picking them up off the floor in a million pieces because the boys have broken them. Most of my decorative items are up high or on walls. I use my office to display some fun decorative things because they do not go in there often, especially if I’m not in there. I have this vase of flowers with clear beads inside. This might be Maddox’s favorite toy. He likes to take the beads out of the vase and rearrange the flowers. I’m stubborn and keep them there, but it’s super frustrating! Just yesterday, I found 20+ beads under the cushion of the chair. The older the boys get though, the less they play with decor. So there ya go, another Ask Me Monday post in the books. How do you stay content or happy in your home/life? Any tips on decorating with kids? A majority of you asked about home/life management, so I think I’ll tackle some of that next Monday. Awesome topic! I’ve totally got the itch to redecorate my house, but I’m trying to focus on decluttering it completely first. I figure that once I have a clean slate, I’ll go from there. We have to tackle projects very slowly too! Your have a talent for decorating and always make things look great! I love your house and you are always good a putting things in perspective. Great post, sweet friend! Love this post and I agree mindset is important. When I want something I can’t afford I envision how nice it will be to be able to retire without financial stress. I loved this post! Decorative items becoming toys is so my life right now! Thank you so much for this post! I am struggling big time with contentment right now. My husband and I are firm Dave Ramsey believers and have 0 debt…. besides the darn mortgage. We are gazelle intense at paying it off but I feel like I have the devil on one shoulder telling me I need to do “this”, and that I need to do “that” instead and DR on my other shoulder reminding me that a paid off house should be our goal. 🙂 We too do not do any projects on our home that we can’t pay cash for right then and there. That means furniture comes from Craigslist, we pay cash for paint (AND the supplies to use with it! ), or we just don’t do it until we have the $$. Thanks for being a breathe of fresh air. Erika Slaughter’s blog referred me to you a few months ago and you have become a fast favorite. Please keep up the encouraging, great work!! Thanks Lindsay for commenting! You’re so sweet. I TOTALLY feel you on wanting to do other things with your money. I still struggle so know you’re in good company. I’d recommend reading The Millionaire Next Door. It will reaffirm your goals and priorities! And glad you found me through Erika…love her!